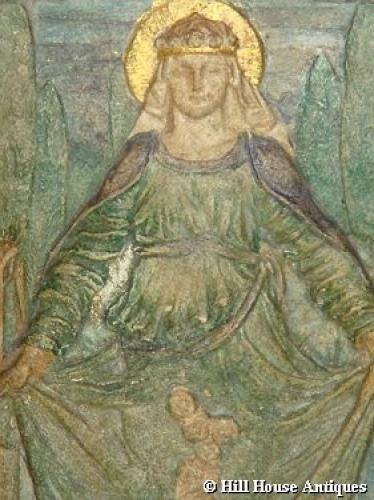 Good small rectangular polychromed plaque by the Compton Pottery in Surrey of a female saint with flowers(impressed wheel mark to back). The Compton Pottery was started by the remarkable Mary Seton Watts (nee Mary Fraser-Tytler) (1849-1938). Symbolist craftswoman, socialist and pioneer of the Celtic style much used at Liberty was the only individual designer/craftsperson ever mentioned by name by Liberty & Co, thereby breaking their traditional policy. Wife of the celebrated Victorian artist GF Watts. She created the amazing Art Nouveau Watts Chapel in Compton, Surrey, full of motifs derived from Celtic, Buddhist, Hindu, Egyptian, Persian and Assyrian folk traditions. An artist in her own right, her skills extended to Comptons [terracotta] wares, book-binding, carpets, textiles and metalwork.